All members of the CHBA welcome to attend the 31st Annual PRISM Awards and Gala being held at Charleston Gaillard Center! Welcome Terry Haas, seen on HGTV's "Designed To Sell", as this year's Emcee! $269++ Special Rate at Francis Marion Hotel. Offered now through October 1st. 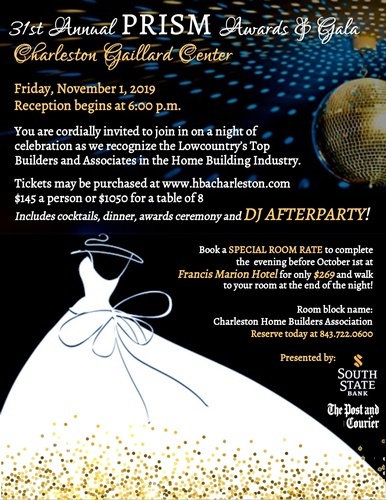 Book at 843.722.0600 with room block name: Charleston Home Builders Association. DJ AFTERPARTY!!! Stick around for more fun, dancing the night away! DJ AFTERPARTY presented by Aqua Blue Pools!! !